The architectural practice of Bartlett School of Architecture Unit 17 tutor Niall McLaughlin has been shortlisted for the 2013 RIBA Stirling Prize. Niall McLaughlin Architects are shortlisted for the new Bishop Edward King Chapel at Ripon College, Oxfordshire. The chapel was built to serve a theological college and a small religious order of nuns. It is described by the RIBA as 'an uplifting spiritual space of great potency' and 'materially rich...an incredible showcase for modern British craftsmanship'. Other shortlisted practices include Hawkins\Brown and Heneghan Peng, whose teams include a number of Bartlett graduates. 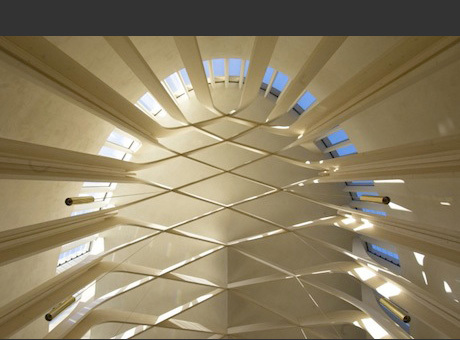 The RIBA Stirling Prize will be announced on the evening of Thursday 26 September. This year's judges are Stephen Hodder – architect and RIBA President Elect; Sheila O’Donnell – architect, O’Donnell + Tuomey; Paul Williams – architect, Stanton Williams; Dame Vivien Duffield – philanthropist and Chair of the Clore Duffield Foundation; and Tom Dyckhoff – journalist and broadcaster. Previous winners of the RIBA Stirling Prize include: Stanton Williams, Zaha Hadid Architects, and Rogers Stirk Harbour + Partners.